The Three Sisters of Glen Coe are some of Scotland’s most iconic mountains, and certainly among the most photographed. Glorious on a summer afternoon but formidable in winter, they loom like silent monsters above the thousands of cars, coaches and walkers that pass along the A82. There are points when the summits feel close enough to touch, and others where they seem so remote that you can only reach them in your dreams. 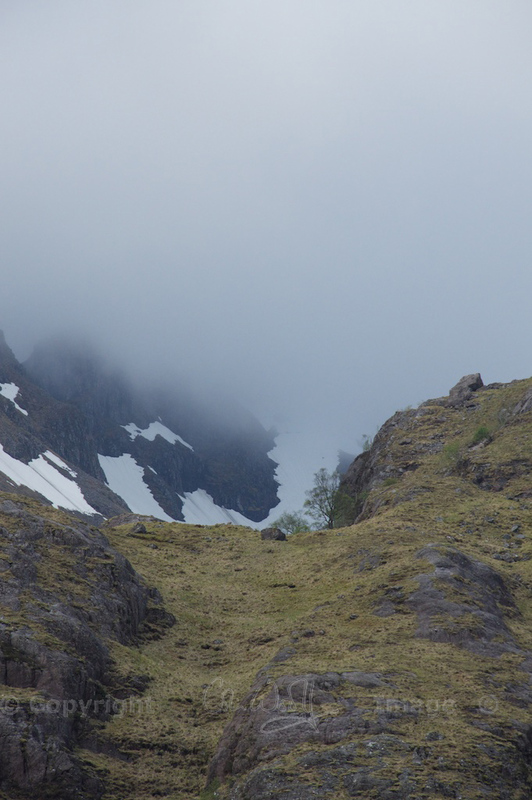 One of the ridges of the Three Sisters is called Aonach Dubh, and on a vertical rock face is a narrow opening known as Ossian’s Cave. From below, it looks like a dark keyhole cut into the mountain, and it’s surprisingly difficult to locate, despite being about eight feet in height. Despite its symmetrical appearance, the cave is natural rather than man-made, having formed when a column of basalt dropped away at some time in centuries past. In legend, this cave was the birthplace of Ossian, son of Fionn mac Cumhail, an Irish warrior hero, and a woman called Sadbh or Saba. A druid named Fer Diorich was in love with Sadbh, but she spurned his love and so the druid struck her with his hazel wand and transformed her into a deer. Fionn mac Cumhail hunted the deer with his hounds, but curiously his dogs refused to close in for the kill; when Fionn called them off, he was amazed to see a beautiful woman instead of a gentle deer hind. The two fell in love, and soon Sadbh was pregnant; but Fer Diorich tricked her again and turned her back into a deer. She returned to the wild and gave birth to a son, named Ossian or Oisín, meaning ‘little faun’, in a cave high above Glen Coe. Fionn never saw Sadbh again, but he is said to have discovered his child on Benbulbin, a mountain in Ireland, seven years later. When Ossian grew up he was welcomed into his father’s band of supreme warriors, known as the Fianna. With his deer-like qualities, Ossian could leap higher and run faster than any other man, and his footsteps through a woodland were ‘lighter than starlight’. He also wrote the most beautiful verses of poetry. He was destined to be taken across the waves from Ireland to a place of timeless beauty known as Tír na nÓg, ‘the land of youth’, where he was married to Niamh of the Golden Hair. But he grew to miss his family and his companions, and galloped back across the waves to Ireland. On putting his foot onto the sandy shore, time immediately caught up with him and he became an old man in a matter of seconds; he was just able to relate some of his experiences to Patrick, a holy man, before he died. 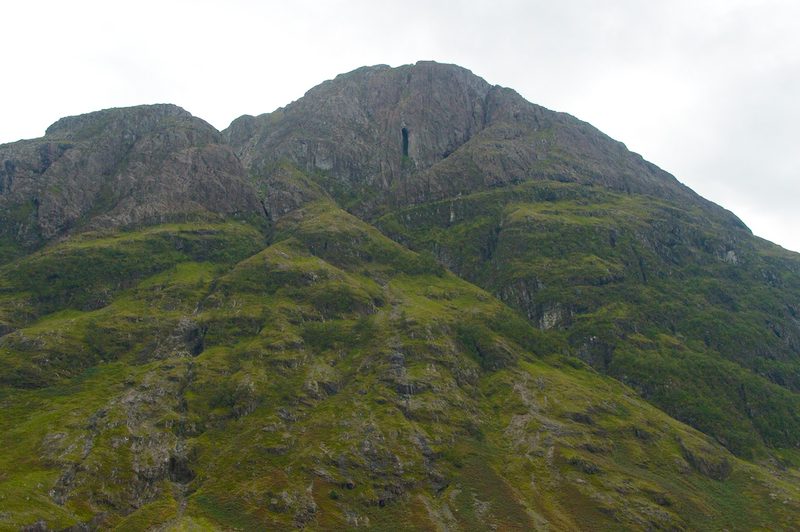 Unless you’re a world class climber, Ossian’s Cave is best viewed from the safety of the glen! Perpetually damp, mossy conditions and a dizzying drop mean that you are dicing with death, whatever the season. It’s no coincidence that the early Himalayan climbers used to hone their skills on the treacherous rock faces of Glen Coe. Aonach Dubh is the third of the Three Sisters if you’re approaching from the east; pull off in the car park overlooking Achtriochtan, by the National Trust for Scotland cairn, and you should be able to make out the cave on the face of the mountain. It should be said that there are several versions of the Ossian legend, and many places are connected with him, both in Scotland and Ireland. His story was the inspiration for ‘The Wanderings of Oisin’ by W B Yeats. In the 1700s a writer called James Macpherson published a series of poems which he claimed to have translated directly from an ancient source of Ossian’s poetry, but the validity of these has been disputed. Footnote, 2nd July 2016: Martin Ross and two friends climbed up to Ossian’s Cave on 23rd June – you can see some brilliant photos and a video of their ascent/descent in Martin’s Flickr album. Beautiful photos and telling of the tale; also, I’m glad you included the cautionary bit about the skill level of climbers. These mountains look easy to climb to some, but they are most definitely not! Thank you! Yes, by all accounts it’s almost impossible to get to, although one friend on Twitter tells me there was once a visitors’ book in there! Jo, I live not far away, and I took my two older kids (then 15 and 12 1/2) up there for a sprachle 28 years ago. The climb up to the base of the rock in which the cave is is relatively easy and no special skill is required, but getting into the cave itself could be dodgy and getting out again even dodgier, which is why we didn’t do it: we simply scrambled on up to the ridge, and sat there for a while looking DOWN at RAF jets flying past us! How fantastic! What an experience. I love ‘sprachle’ – not heard that before! 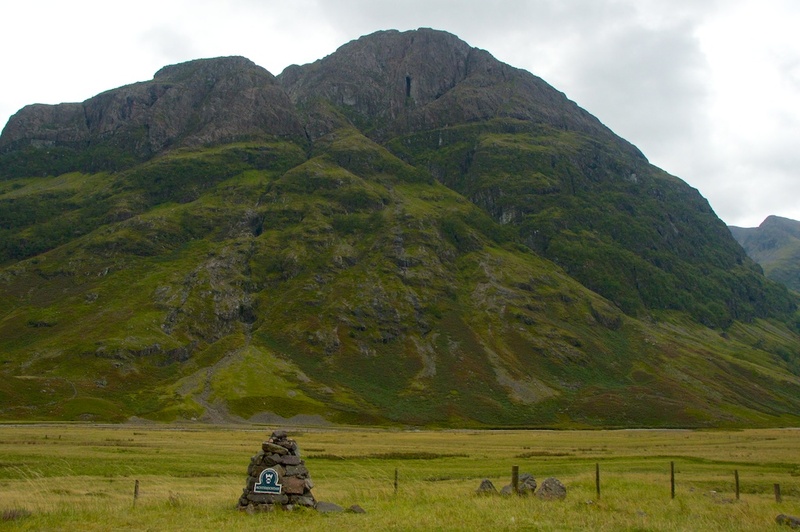 Steeped in story of loss, death and sadness, is is any wonder that I can barely bear to drive through Glen Coe. It gives me the heeby-jeebies. But I enjoyed your account! Thanks, Viv, and I know what you mean. There is such a feeling about Glen Coe, indescribable sadness. What a wonderful legend. I can imagine that cave luring people to it, although it looks quite terrifying in your close-up. I’ll settle for viewing it from below. I know, Lorna! Yes, I’ve never been one for clambering around a vertical rock face, so I’m with you on that one! Excellent and fascinating post Jo, and some stunning photos of the magnificent Glencoe to go with it 🙂 Who could ask for more!!! Thank you, Andy! 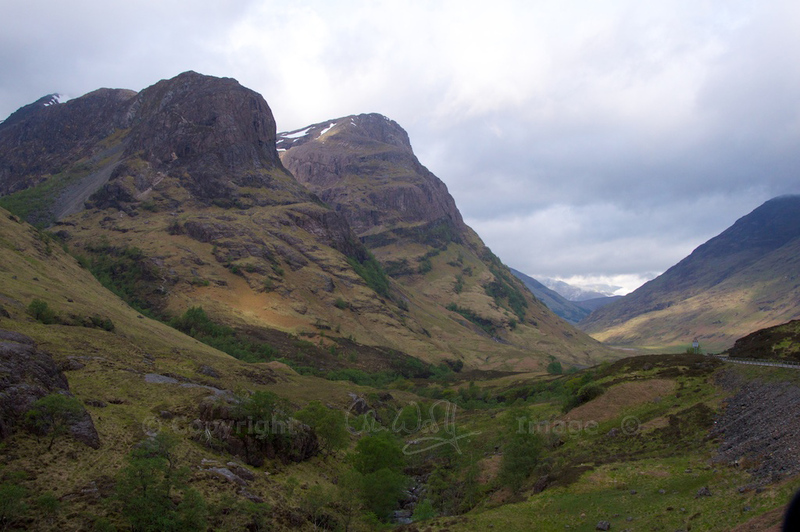 Yes, Glen Coe always takes your breath away, no matter how many times you see it. Very interesting Jo and very clear photos . I must confess I’ve never seen it so obvious before. I was rather hoping that you had scrambled up to it and could give some feedback. Accounts of the scramble to it vary considerably in terms of difficulty. Love the first photo and will have to make sure we have a look next time we are passing. Its rather tempting to have look inside but like you my rock climbing days are over 🙂 By the way are there another set of mountains on Skye or Mull that are call the three sisters. It would be a shame if a place as beautiful and atmospheric as Glen Coe didn’t have some sort of ancient legend attached! I didn’t know about the association with Oisín, though, so thanks for a very interesting read! You’re most welcome, and I’m glad you enjoyed it. I only found out about the Oisin legend fairly recently myself, but I love it too! The climb into the cave is a fairly easy one, it’s called “Ossian’s Ladder’. The Ladder is a wet, vegetated route, but it’s not a very techincal climb. It’s not much of a cave inside, the floor slopes at a 45 degree angle and this is where accidents occur. Thank you for explaining this. It certainly doesn’t look easy but I’ll take your word for it! 🙂 That’s interesting, because from a distance, I thought that I could make out that the floor was sloping – so not much of a refuge, then! I’m doing Ossian’s Cave next week on the 23rd June, weather permitting. Will get some nice photo’s from inside the cave and hopefully my GoPro will behave so I can film climbing up the mossy slope, roped of course. I’ll get the photos online if anyone’s interested. I will do, weather will hold hopefully. Once I get back on Friday I’ll upload them to Flickr and post the link. I have pics if anyone would still like to see them, a few before the climb, some on the route, and one right inside the cave. I gave the cave climb a go and made it to the fixed grey coloured rope you can see in the pics. Someone left that rope in place but it’s been there for a good while now, through all seasons, it’s still in reasonable condition but I wouldn’t use it as my only rope. It was not meant to be that day, but the cave will wait and I will be make another attempt soon. For sure 🙂 be taking gloves from the scramble on the way up to the cave. Very entertaining account and link to the flickr page. In 3 weeks I am walking from Perth to Ft William with two other Californian’s and will first pass the “less authentic” Ossian’s Cave by Dunkeld before we pass beneath this one six days later. I am prepping myself with lore so this was a great read. We also have “The Three Sister’s” in Yosemite but they are more properly known as Cathedral Rocks. Thank you! That sounds like a fun trip – from east to west. At Dunkeld you might also like to look at the Birnam Oak, supposed to be a remnant of Shakespeare’s ‘Birnam Wood’ from Macbeth – but really there’s so much folklore everywhere you look, I’m sure you will find heaps! 😀 I will look up the Three Sisters – sounds interesting. Hope you have a wonderful time!